Michael Boyett grew up in a military environment. His father, a career officer in the US Air Force, moved frequently across the US, exposing Michael and his family to much of the diverse history and romance of our country. 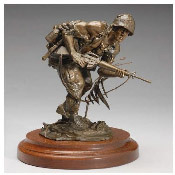 After attending the University of Texas Art School and graduating from Stephen F. Austin State University, Michael joined the US Army, where he served as an infantryman during the worst years of the Vietnam War. It was there that he was wounded in action in an enemy ambush. That, along with other experiences in Vietnam, burned a deep sensitivity into his nature which is vividly expressed in his works of art today. Interest in heroic historical America, coupled with desire for realism, lead to the development of his moving and powerful style. 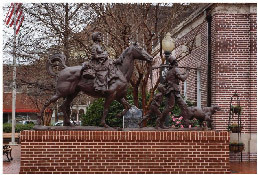 He dramatically stresses the qualities of movement and detail and because of his love for American history - he is careful to portray every detail with precise authenticity. Michael believes that each sculpture should give the viewer the sensation that he has actually witnessed an event in history. It is equally important to him to pay tribute to the significant people and events that have shaped the unique heritage of our country. As a professional fine artist, Michael has established a considerable reputation in the art world. 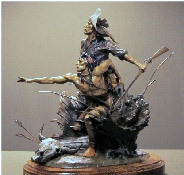 His sculptures have been produced and sold by various nationally known corporations, fine art galleries, museums, heads of state, military institutions and distributed throughout the US and many foreign countries to thousands of collectors. His range of talent has been proven by being able to sculpt in scales from miniature to monumental with consistent skill and drama.